Thailand’s military declared martial law Tuesday in a bid to end the violence that has gripped the country since protests began in November to remove then-Prime Minister Yingluck Shinawatra, but insists the move is not a coup. “We are concerned this violence could harm the country’s security in general. Then, in order to restore law and order to the country, we have declared martial law,” Thailand’s military chief General Prayuth Chan-ocha said. Two weeks ago, a Constitutional Court found Yingluck guilty of abuse of power and violating the constitution, and ordered that she be removed from office. Her supporters, known as the Red Shirts, have since then held nationwide demonstrations. A government emergency meeting nominated deputy prime minister of economy, Niwattumrong Boonsongpaisan to be acting prime minister of an interim government. 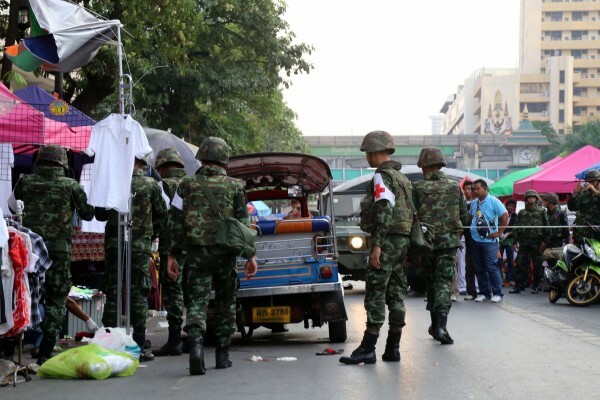 But within a week, the political impasse over scheduling a new date for elections led to violence in the capital Bangkok. On May 14, three anti-government protesters were killed when a passing truck opened fire with machine guns and grenades. Dozens were injured. Later, anti-government protesters stormed a military barracks in hopes of disrupting a meeting regarding the elections. The death toll since protests began in November has reached at least 30 with about 800 injured. The military has twice before warned that it would not allow the violence to spiral out of control and threaten public safety. In February, the situation had become so volatile that Prayuth broke his months-long silence and called for adherence to the country’s constitution; he also asked all sides to refrain from violence. On May 15, the military again issued a warning for pro and anti-Yingluck protesters to stand down.